I missed the mares but had a good look at the two-year-old fillies. Number 3 Ploverset looked the goods down the back and TAB man in charge of the betting caravan kindly gave me a tutorial on how to place a bet on a machine. I’ve never used one before since I much prefer using my iPhone or handing my cash over to a real human being. 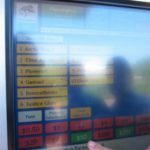 But it’s probably better than betting with a tote lady as you can toggle between the tote odds and the fixed odds. Ploverset was showing $2.34 fixed for the place. But I didn’t press the bet button for $250 as I still needed to see the horses in the yard. In the end I crossed them all out and didn’t have a bet. Ploverset got up for third and I got a hard time from my tutor for not pressing that button! 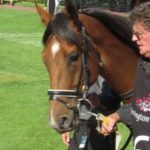 Only six runners in the Blamey Stakes. I narrow it down to two – Palentino and Sir Isaac Newton. Palentino has the earmuffs (now +12%) and the two strappers (+28%) and is sweating freely. Hey, wait a minute. Those earmuffs belong to CJ Waller! Has Weiry run out of gear? I guess if you bring ten horses to the races you can’t remember everything and may have to go scrounging! The famous mathematician/physicist/astronomer also has the two strappers, is salivating (+19%), sweating, and has that indefinable something – presence. I decide to back him. Sir Isaac misses the jump by two lengths and then charges to the lead as previously notified. Nobody notified me that they were going to crucify him in front! Palentino was strong to the line and the scientist wilted. The horsewatcher wilted too. Not much else to report. Big Effort had a Hanoverian noseband, which is similar to a conventional cross-over noseband but with a heavier duty padded nosepiece. Its function is till the same – to keep the horse’s mouth shut. As you know, I’m not a fan. The horse finished last! The favourite for the cup is Humidor – what a great name for a horse. Break out the cigars! 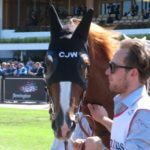 The former Kiwi horse has been described in the press as “quirky” and with poor pre-race behaviour. I’ll have to have a close look. I have no trouble finding how to get from the stalls to the mounting yard as the club has kindly painted some white lines on the lawn to show me the way. The green brick road? But you have to run to avoid being stranded on the wrong side of the laneway out onto the track. I make it in time but since there is now only half the mounting yard fence available for horsewatchers I’m stuck three deep. Humidor is jig-jogging around but not changing his stride. You could call it prancing (+73%), but his head is not properly arched, so I’d call it quirky prancing. He has the ear muffs on to control his quirkiness (+8% in the book, now showing +12%). I like ear muffs. There are two strappers (+28%), he’s snorting (+21%), but his neck is a bit twisted (-1%). I tried to do a video but it was too hard being three deep. The clerk (-11%) takes the horse onto the track early (-6%), to avoid problems I suppose. So a bet on quirkiness. $1.80 for the place is a borderline bet for me, but not too bad. The horse was last on the turn, but came home smoking! My first day back at Flemington since the spring. There seem to have been a few changes. 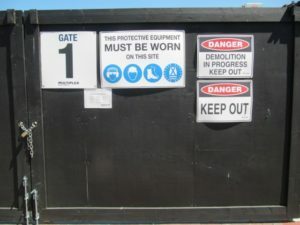 The gate I normally walk through to get to the mounting yard has been replaced with a quite formidable black barrier with heavy duty padlock and chain. It seems pretty clear that I am not welcome unless I’ve got a hard hard hat and high vis vest. In fact, it’s quite explicit “KEEP OUT!”. 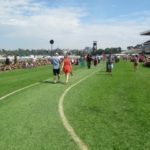 To get to the mounting yard from the parade ring I have to detour around the black barrier, past the rails bookmakers who are now standing in no-man’s land with no customers, duck through under the Hill Stand, and emerge at a tiny area alongside the mounting yard reserved for members. What a disaster! And look. Where has my refuge, the Island Bar, gone! I reckon it used to be where that monster Delta digger is resting. And where will I get my iced water? 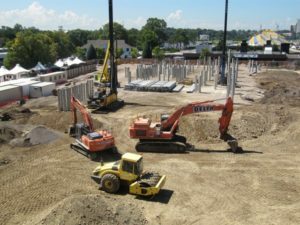 Apparently the new stand won’t be ready till 2018. It’s going to be chaos in the spring. Can the rails bookies sue the club for lack of business? It took me a few races and a couple of losers to sort things out. Chaos Ball looked good in the two-year-old but played up in the barrier and was pulled out and inspected by the vet. I would have scratched the horse but of course the vet let it run and my bet was history. Chaos Ball finished last. And I quite liked Sadaqa in the sixth but the horse did nothing. I finally worked out that the easiest way to get from the stalls to the yard was straight up the public lawn. 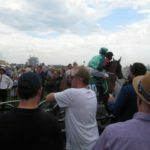 The only problem was that you have to wait at the gate till all the horses, stewards and sundry officials have gone onto the track. But I found the iced water at last hidden in the undercroft. 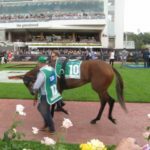 Hey Doc looked the goods in the Guineas with its head in towards a positive strapper. The $1.80 gave me some back and I came home like a train with Cadillac Mountain, quietly flipping its lip, and paying $3.30 for the place. I’m not sure what lip flipping is about and whether it is a stereotypy but it is certainly a positive (17% in the book) and the horse must be comfortable with the bit in order to do it. So, I finished with two out of four for the day, grumpy, and not looking forward to racing at Flemington.